Thanks for patronizing this blog. This clipping has been hiding in our storage area for more than 19 years. I didn't know Star Cinema is already 19 years old. Ganun na ba ka tagal ang Star Cinema? vintage talaga to. Oo. Nineteenth anniversary offering 'yung "Every Breath U Take" na kapapalabas lang sa mga sinehan. "Ika-11 Utos: Mahalin Mo Asawa Mo"
a follower huh! parang di ko remember nanood ako ronquillo.. but would love to watch every breath u take! Grabe! 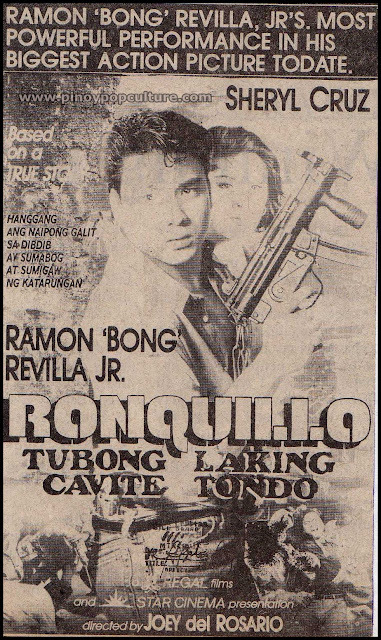 Uber luma na ng poster ba yan nila Bong? lol.. but, it's good to know the history of Star Cinema.. I'm wondering what the 20th anniversary offering will be. wow, tagal na ng newspaper clipping na yan, hehehe! i always remember sheryl cruz and romnick sarmienta tandem way back when i was a little girl. haha!